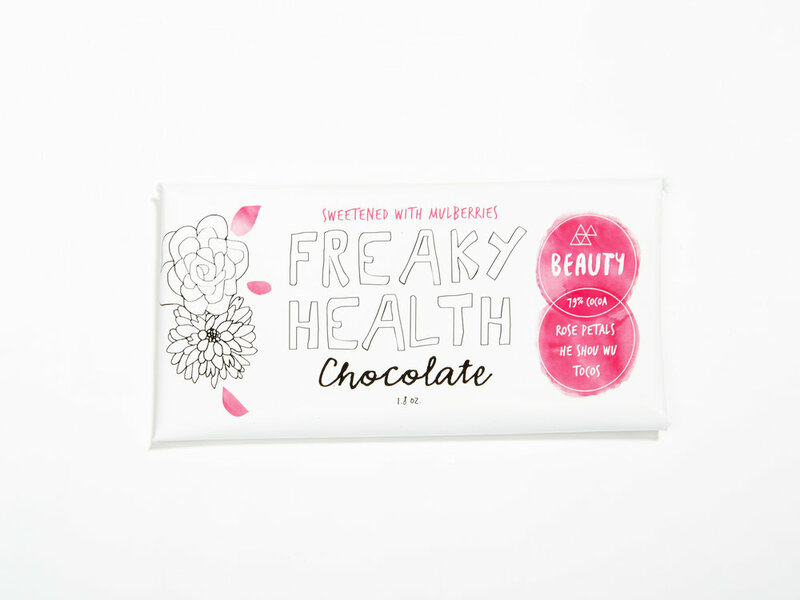 WHAT'S THE MISSION OR PHILOSOPHY OF FREAKY HEALTH CHOCOLATE? 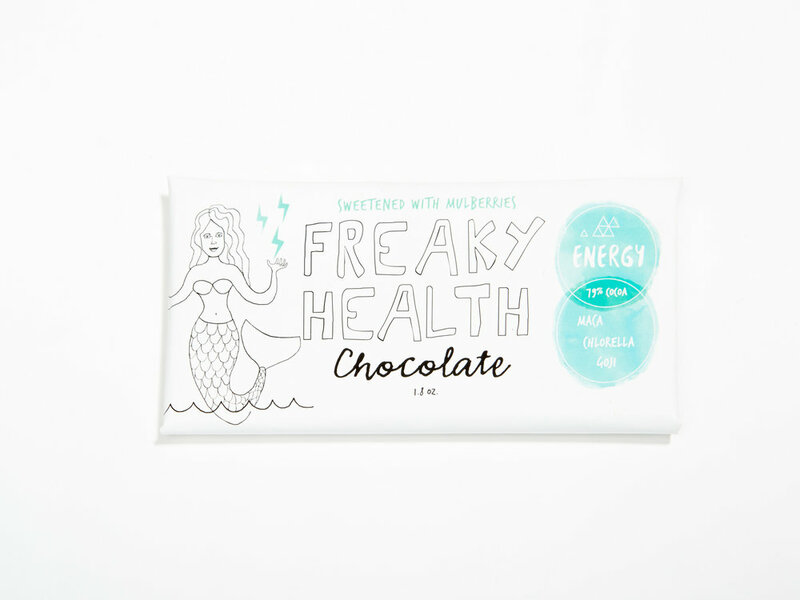 Freaky Health Chocolate is a delivery system of ancient healing herbs and superfoods. I don’t consider it to be a part of the candy industry because it is a healing, nutrient dense food. I want whoever is ready to accept these life changing herbs in their life to have access to them in a simple delicious way. I want people to feel well while enjoying the benefits and the experience of eating Freaky Health Chocolate. How specifically is Freaky Health Chocolate safe for kids? It’s safe for kids because it’s refined sugar free. My kids eat (what I consider to be) super healthy. Their diets are really low in sugar compared to the average kid but they are still eating a considerable amount of natural sugars from fresh fruit and dried fruit every day. At 5 and 2.5, neither of them have ever had proper candy yet (save for a few lollipops) but I feel really good about feeding them Freaky Health Chocolate as a treat. It is really low in sugar, full of beneficial antioxidants from the cacao and mulberries, and giving them small doses of all these amazing healing herbs. Oh and it doesn’t have any allergens like nuts, dairy, eggs, or soy - which is a huge one because most commercial chocolate has at least a little soy in it. 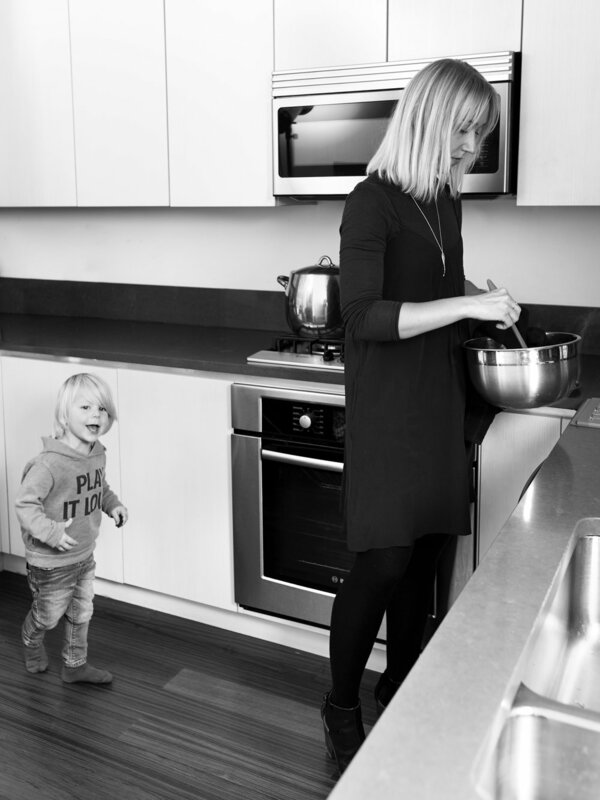 How do you balance being a mother with having a new company? I’ll get back to you when I figure it out! I don’t balance it. I think that’s one of those unattainable goals that working mothers have been made to believe is possible. I’m pretty new to this entrepreneur/mom gig but I have girlfriends who have been working full time since their kids were infants and I don’t think they’ve figured out that balance thing either. I think it changes all the time and if you can accept that and let the balance thing feel more fluid, you’ll be less disappointed. But as far as day to day, I try to cram in as much work as I can while my kids are in school and sleeping so I don’t have to work while I’m with them. I try to be really present when we are together. I know everyone says you have to have me time and self care, and I agree for sure - but I haven’t figured out how to fit that in as much as I’d like. CAN YOU TELL US ABOUT YOUR BARS? HOW ARE THEY CONCOCTED AND DO YOU HAVE A FAVORITE? The bars are made from a really special heirloom cacao variety that grows wild in the rain forest of Ecuador. It is combined with ancient tonic herbs, super foods, and dried mulberries and made into amazing bars. Right now there are three functional flavors. Immunity, which is Chaga, reishi, abhwagandha; Energy, filled with chlorella, maca and goji; and Beauty, which has tocos, rose, he shou wu. I also have a bar that I collaborated on with my friends at CAP Beauty, which is the Mountain High Bar. It features their own Himalayan Pink Salt and is really lovely. They are all made in NYC by me. I eat all them often but right now I am enjoying the Immunity bar because I keep feeling little colds starting and I am constantly loading up on herbs and immunity boosting foods to kick them as soon as they start. Which is your children’s favorite bar? They like them all! They will definitely not turn down any of my chocolates. But they love the packaging the most so they will ask me for the unicorn (Immunity), mermaid (energy), flower (beauty), or mountain (mountain high) whenever they have the chance. What was your morning like today? Today I got up at 6:30 and had a moment to make my coffee and clear my head before my wild kids woke up. We try to have a quick snuggle on the couch while we are still a little sleepy and the world feels quiet. I sip my coffee and their little faces seem to wake up. It’s really sweet. The kids jump right into playing and I work on breakfast for them. Today it was yogurt with berries, banana, bee pollen, chia, and seedy granola. My husband sits and eats with them while I work on packing lunches. I always try to have some calm-ish music on in the morning. It’s a nice way to set the tone for the day. We listen to a lot of music at home. If the kids finish their breakfast early enough they have a few minutes to build lego with their dad and get a jump start on whatever big building project they have planned for that evening. We pack up all our things for the day, the kids hop on their scooters, and we are off to school. After drop off I’m either heading to the kitchen to make chocolate or to a cafe to work (today was a cafe day). I really try not to check my emails until I start my work day. Balance, right? Flying. Honestly, what could be more magical? Also, it would make getting around town so much faster and more fun! My girlfriends. If I don’t have some good face-to-face girl time for a while, I start to get cranky. Yoga classes at Sky Ting. Running, sometimes. Taking solo bike rides down the east side. And music, always music, all day. IF YOU WERE STRANDED ON A DESERT ISLAND, WHAT ARE THE FIVE THINGS YOU WOULD BRING? My Vita-mix, RMS Living Luminizer, Cap Beauty Anointing Oil, a journal to write in, and a bar of Freaky Health Chocolate, of course!